In March 2009, Duncan Brownlie offered us for publication his extensive research on the War Dead of Dartmouth, together with many of his photographs. His hard work has produced an enormous amount of detailed information, which constitutes a worthy tribute to the men who are named. We are most grateful to Duncan for enabling the creation of this record of Dartmouth's war dead. 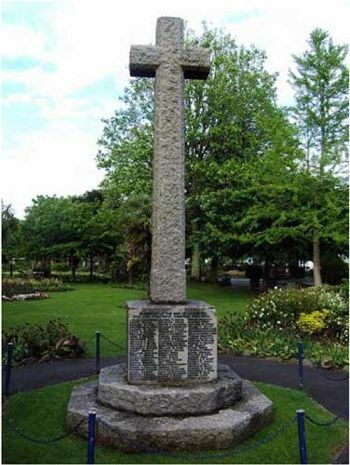 Dartmouth War Memorial, which stands in the Royal Avenue Gardens, was officially opened by the Prince of Wales in 1921. Note the men, Edward Ash and Frederick Tremlett, who actually died in 1920. 13 sets of brothers have been identified, Bell, Bowhay, Burnell, Carder, Foxworthy, Hearn, Hodge, Lock(e), Ridges, Turner, Widdicombe, Willing and Jolley, though there are probably more not identified as such. He is also listed on the Dartmouth St Saviour's Church Plaque. Fitter Staff Serjeant 509 Harry William Algar, 1/2nd Devon Battery, Royal Field Artillery. He died on the 10th September 1915, and is buried at Dinapore No. 3 Cemetery, India. He is also commemorated on the Madras 1914-18 War Memorial, Chennal, India. Soldiers Died in the Great War records that he was born and enlisted at Dartmouth. He is also listed on the Dartmouth St Saviour's Church Plaque. Chief Stoker 294823 Edward George Ash, HMS Marlborough, Royal Navy. He died on the 5th February 1920, and is buried at Haidar Pasha Cemetery, Turkey. He was born at Brixham, Devon in 1881. Leading Stoker K/2587 Frederick Arthur Ash, HMS Indefatigable, Royal Navy. He died on the 31st May 1916 aged 25 at the Battle of Jutland, and is commemorated on the Plymouth Naval Memorial. Son of Mr G. Ash of Lake Street, Dartmouth; husband of R. Jones (formerly Ash) of Anzac Street, Dartmouth. He is also listed on the Dartmouth St Saviour's Church Plaque. Stoker 1st Class K/18809 Samuel Henry Ball, HM Submarine E/4, Royal Navy. He died on the 28th January 1918, and is commemorated on the Plymouth Naval Memorial. He was born at Dartmouth in 1894. He is also listed on the Dartmouth St Saviour's Church Plaque. Second Lieutenant Lewis George Bates, Royal Warwickshire Regiment, attached to the 6th Battalion, East Lancashire Regiment. He died of his wounds on the 24th May 1916 aged 21, and is buried at Baghdad’s North Gate Cemetery. Son of Mr G. E. and Mrs A. E. Bates of L'Esperance, Dartmouth. He is also listed on the Dartmouth St Saviour's Church Plaque. Private 26524 William John Farrow Bates, 2nd Battalion, Devonshire Regiment. He was killed in action on the 31st July 1917, and is commemorated on the Menin Gate Memorial, Ypres, Belgium. Note that the memorial incorrectly records his third initial as ‘P’. 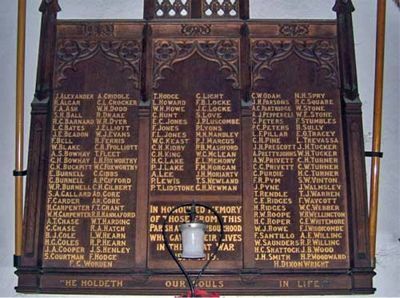 Soldiers Died in the Great War records that he was born and lived at Dartmouth; and enlisted at Newton Abbot, Devon. First Mate John E. Beadon, SS Lorca (London), Mercantile Marine. He died on the 15th November 1916 aged 35, and is commemorated on the Tower Hill Memorial, London. Husband of Maud Beadon of 1 Pebble Terrace, Victoria Road, Dartmouth. Born at Dartmouth. He is also listed on the Dartmouth St Saviour's Church Plaque. Private SP/3130 William John Bell, 24th (2nd Sportsman’s) Battalion, Royal Fusiliers. He was killed in action on the 13th November 1916, and is commemorated on a special memorial in Redan Ridge Cemetery No. 3, Beaumont-Hamel, France. 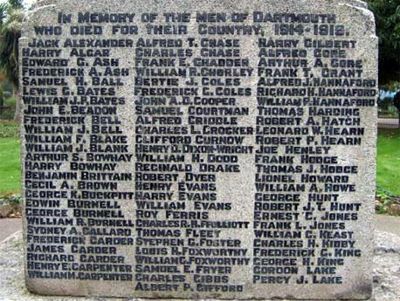 Soldiers Died in the Great War records that he was born at Kingswear, Devon; lived at Dartmouth; and enlisted at Exeter. Frederick Bell could possibly be Private 1171 Fred Bell, 1/7th Cyclist Battalion, Devonshire Regiment. He died on the 5th April 1915 aged 16, and is buried at St Winifred’s Churchyard, Branscombe, Devon. Son of Mrs King (formerly Bell) of 30 Greatlands Crescent, Swilly, Plymouth. Born at Dartmouth. Soldiers Died in the Great War records that he enlisted at Dartmouth. Able Seaman J/3711 William Robert Blake, HMS Musketeer, Royal Navy. He died on the 6th January 1916 age 24, and is commemorated on the Plymouth Naval Memorial. Note that the memorial incorrectly records his middle initial as ‘F’. Son of Robert and Elizabeth Blake of ‘Under Cliff’, Dartmouth. He is also listed on the Dartmouth St Saviour's Church Plaque as W. Blake. Engine Room Artificer 1st Class 268654 William John Henry Blank, HMS Monmouth, Royal Navy. He died on the 1st November 1914 aged 38, and is commemorated on the Plymouth Naval Memorial. Son of Mr W. and Mrs M. Blank of Dartmouth; husband of Annie Elizabeth Blank of 87 Admiralty Street, Keyham, Devonport.